And now for something completely different – a project without patterned papers. This is a small gift for a friend in California whose crafty space is plum, gray, and cream. I found the stamp sentiment at a local store and set out to use it in a project under than a card. I used Lori Whitlock’s 5″ x 7″ shadowbox frame from the Silhouette store. All of the remaining cuts are from Cricut. 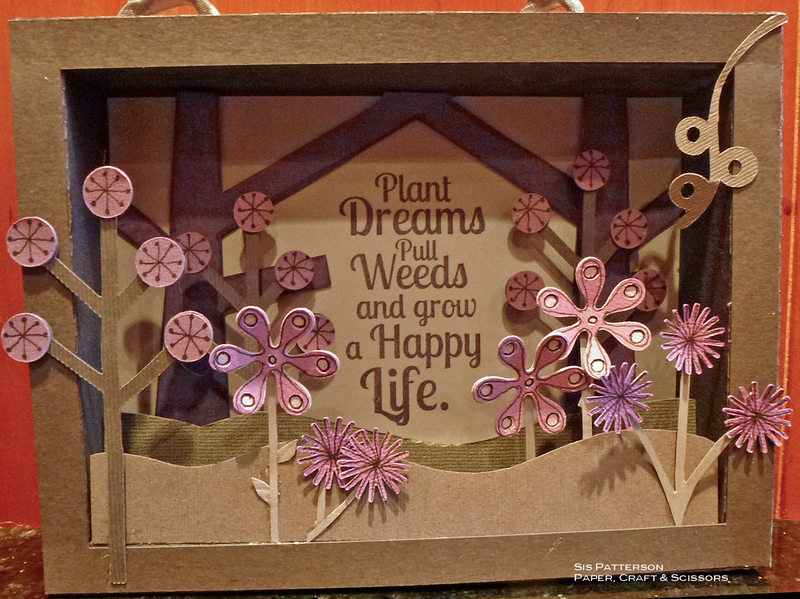 The background trees are from April Showers with the branches extended in Cricut Craft Room to form a house shape. All of the remaining cuts are from Accent Essentials. I used my Copic multi-liner to add the inked detail. The “hills” were cut by hand and adhered to a 6mm foam base to provide for depth and stability. I really liked how this project turned out. I was inspired by the art of Helen Musselwhite. If you are interested in seeing more of her fabulous paper creations, click here. Perfect marriage of the two machines to create absolute art! I love the hand-work– that gives it so much character! That shadowbox cut is going to be the first thing I buy when I get a Silhouette! I love the sturdiness of it! Perfect flowers— and I am shocked that there is no patterned paper! Love it! And I love that you shared your inspiration! Sis, this is beautiful! The colors you chose are quite appealing with your design. The details and hand doodling add so much charm. and are my favorite part of your project. Gorgeous! What a lovely piece of art. Love the colors and the flowers look so pretty. This is definitely a work of art!! Love the shadow box frame and how the branches in the background form a house — and all the detail!! What a wonderful gift!! I visited Helen Musselwhite’s website and can see why you are inspired by her — I fell in love with her Owl Town.